I don’t know about you, but lunch time is my hardest meal to plan. I don’t always like to eat cold sandwiches, and frankly I’m over “kid” food like chicken nuggets and mac-n-cheese. Not to mention that traditional kid food isn’t usually all that healthy anyway! So lately I’ve been experimenting with some new twists that I thought I would share with you all. Now I know the BLTA sandwich isn’t necessarily a new thing, but I’m totally loving this spicy twist on a classic recipe! And the whole thing takes about 5 minutes to prepare, which is right up my alley since that’s about how much time I have to whip something up on school days! Mix in blender and puree until smooth and chipotle’s are totally blended in. Store in refrigerator until ready to use. To make the sandwich, smear chipotle mayonnaise on both slices of toasted bread. Top with lettuce, tomato, bacon, then avocado. Top with the remaining slice of bread and you’re done! Alternative: If your kiddos won’t like the spicy mayo (mine loved it! ), you can just use regular mayonnaise, just add in a splash of fresh lemon juice to make it a little more interesting! Oh my goodness – this looks so good!! I love the addition of avocado and the adobo sauce!!! Oh that Chipotle mayo sounds good…does it keep? I’m a huge fan of eating sandwiches. They’re pretty much my favorite lunch item. 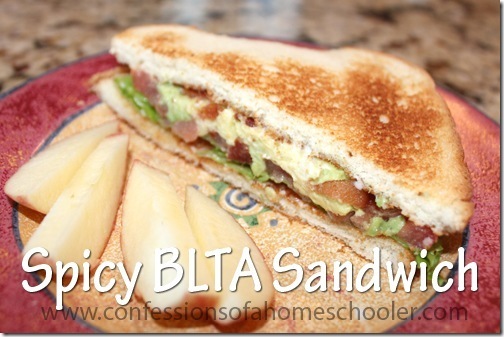 I love the classic BLT, but it’s really great that you’ve posted a recipe that steps up the BLT to a spicy BLTA. Adding avocado and spices to a sandwich with bacon, lettuce, and tomato sounds absolutely amazing. I can’t wait to eat this sandwich for lunch tomorrow for lunch.